San Felasco State Preserve is a 7,000-acre publicly-owned biological preserve. The Preserve is characterized by the karst topography found throughout much of northwest Alachua County and the north central Florida region. Found within the Preserve are rolling hills, oak hammock forests, pine flatwood forests, prairies, sandhills, hydric hammock, swamps, bluffs, creeks, and sinkholes. Wildlife found here include the gray fox, white-tailed deer, bobcat, and turkey. In recent years, the 2,000 acres in the northern portion of the preserve were designated for horseback riding, mountain biking, and hiking. 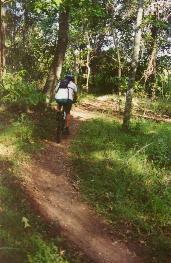 From 1999-2001, the Friends of San Felasco Hammock, Inc., a volunteer group, joined with other volunteers to construct a 14-mile network of unpaved mountain bike trails. "Cotton Tail" is a 1-mile beginner trail. "Cellon Creek Loop" is a 4.2-mile intermediate trail, and "Tung Nut Loop" is an 8-mile advanced trail. 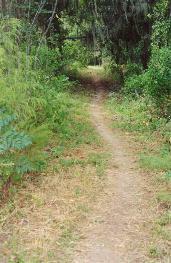 They are the first legal off-road bicycle trails built in the Gainesville area. My group selects Cellon and Tung Nut. The trails are diverse, and the surface-unlike many Florida off-road trails-is reasonably smooth and firm, instead of sandy and full of tree roots. There are a number of winding sections, log ramps/hills to climb, and small "ups and downs." The trails pass sinkholes and creeks, and passes through rather pretty pine and oak forests. There are no steep uphills or downhills, but there are fairly steady grades of ups and downs, and a number of fairly lengthy straight sections. I find that the trails are both "intermediate" in terms of the technical skill required to ride them, but because of the good riding surface, higher speeds can be achieved, which can make for stimulating riding. But the pleasing scenery and gentle features makes for an experience that all types of riders can enjoy.